Constellation Ursa Major the Great Bear is a northern constellation above constellation Leo and below constellation Ursa Minor, between constellation Draco and constellation Coma. 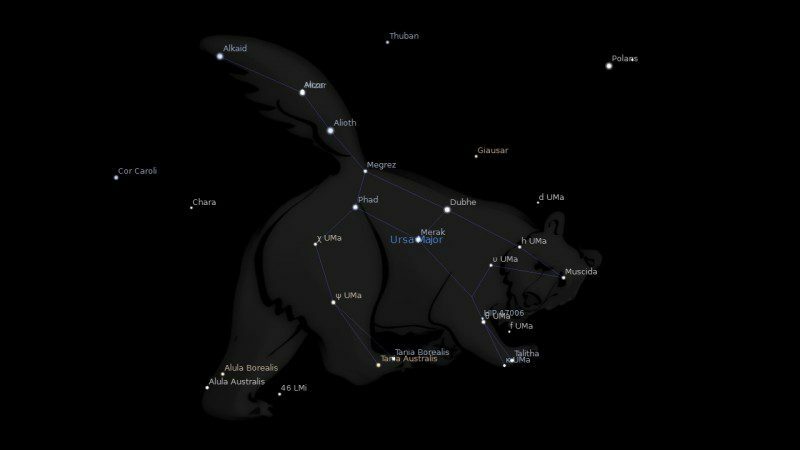 Ursa Major spans 65 degrees of the Zodiac in the Sign of Cancer, Leo and Virgo, and contains 18 named fixed stars. Callisto, daughter of Lycaon, king of Arcadia, of whom Jupiter was enamored, became a follower of Diana on account of her love of hunting. Jupiter sought Callisto by assuming the form of Diana, and Juno who discovered the intrigue turned Callisto into a bear. Angry that the bear was placed in heaven, Juno requested her brother Neptune never to let those stars set within his kingdom, and for this reason they are always above the horizon in Europe. To account for the length of the bear’s tail, it is said that Jupiter, fearing her teeth, lifted her by the tail, which became stretched because of her weight and the distance from earth to heaven. 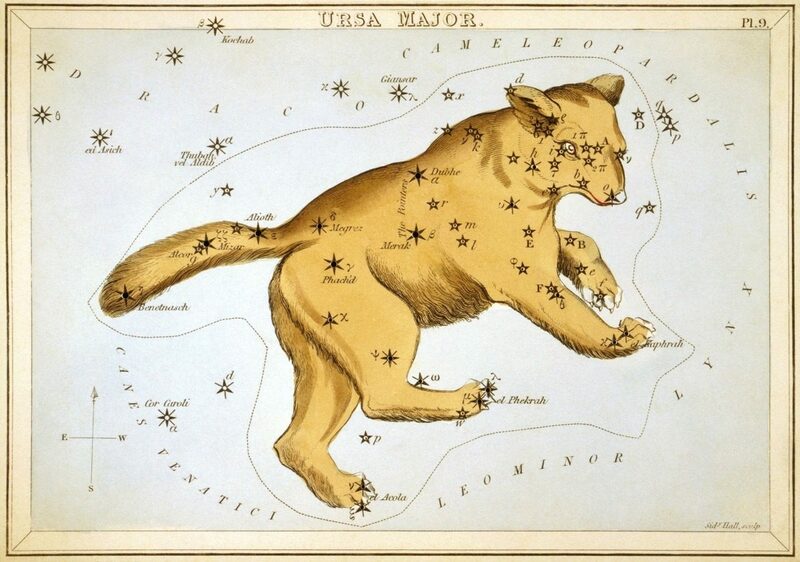 Ursa Major, the Greater Bear, always has been the best known of the stellar groups, appearing in every extended reference to the heavens in the legends, parchments, tablets, and stones of remotest times. Heis now catalogues 227 components visible to his naked eye, although only 140 appeared to Argelander, down to the 6th magnitude. Although the group has many titles and mythical associations, it has almost everywhere been known as a Bear, usually in the feminine, from its legendary origin. All classic writers, from Homer to those in the decline of Roman literature, thus mentioned it, — a universality of consent as to its form which, it has fancifully been said, may have arisen from Aristotle’s idea that its prototype was the only creature that dared invade the frozen North. The well-known, although varied, story of Kallisto, — as old as Hesiod’s time, — who was changed to a bear because of Juno’s jealousy and transferred to the skies by the regard of Jove, has given rise to much poetical allusion from Hesiod’s day till ours, especially among the Latins. Another version substituted her divine mistress Artemis; — also known to the Greeks as Kalliste, the Roman Diana — for the nymph of the celestial transformation; the last Greek word well describing the extreme beauty of this constellation. La Lande, however, referred the title to the Phoenician Kalitsah, or Chalitsa, Safety, as its observation helped to a safe voyage. Smyth wrote in his Speculum Hartwelliauum: “King Arthur, the renowned hero of the Mabinogion, typified the Great Bear; as his name, — Arth, bear, and Uthyr, wonderful, — implies in the Welsh language; and the constellation, visibly describing a circle in the North Polar regions of the sky, may possibly have been the true origin of the Son of Pendragon’s famous Round Table, the earliest institution of a military order of knighthood.” Whatever may be the fact in this speculation, we know that the early English placed King Arthur’s home here, and that the people of Great Britain long called it Arthur’s Chariot or Wain. In Ireland it has been King David’s Chariot, from one of that island’s early kings; in France, the Great Chariot, and it was seen on Gaulish coins. The Anglo-Norman poet De Thaun of the 12th century had it Charere; and La Lande cited the more modern la Roue, the Wheel. Occasionally it has been called the Car of Bootes. But the astrologers of Shakespeare’s time ascribed to it evil influences, which Edmund, in King Lear, commented upon with ridicule: This is the excellent foppery of the world, that, when we are sick in fortune, (often the surfeit of our own behavior), we make guilty of our disasters the sun, the moon, and the stars. Both of the Bears have been frequently found on the old sign-boards of English inns, and, in a more important way, are emblazoned on the shields of the cities of Antwerp and Groningen in the Netherlands. Ancient, however, as are Arktos and Ursa, ‘Ash and the Bier, Amaxa, Plaustrum, and Triones, this splendid constellation ran still further back — three or four or even more millenniums before even these titles were current — as the Bull’s Thigh, or the Fore Shank, in Egypt. There it was represented on the Denderah planisphere and in the temple of Edfu by a single thigh or hind quarter of the animal, alluded to in the Book of the Dead as; The constellation of the Thigh in the northern sky; and thus mentioned in inscriptions on the kings’ tombs and the walls of the Ramesseum at Thebes. Sometimes the figure of the Thigh was changed to that of a cow’s body with disc and horns; but, however called or represented, these stars always were prominent in the early astronomy and mythology of Egypt. Mesxet seems to have been their designation, and specially for some one of them, as representative of the malignant red Set, [Set, also Anubis, Apap, Apepi, Bes, Tebha, Temha, and Typhoeus according to Plutarch, was one of Egypt’s greatest gods, who subsequently became the Greek giant Typhon, father of the fierce winds, but slain by Zeus with a thunderbolt and buried under Mount Aetna.] Sit, or Sith, Sut or Sutech, who, with his wife Taurt or Thoueris, shown by the adjoining Hippopotamus (now a part of our Draco), represented darkness and the divinities of evil. Set also was a generic term applied to all circumpolar constellations, because, as always visible, they somewhat paradoxically were thought to typify darkness. Hewitt writes of Set in his earliest form as Kapi, the Ape-God, stars of our Cepheus marking his head; while at one time on the Nile the Wain stars seem to have been the Dog of Set or of Typhon. This may have given rise to the title Canis Venatica (Canes Venatici ) that La Lande cited, if this be not more correctly considered as the classic Kallisto’s hound; and the same idea appears in the Catuli, Lap-dogs, and Canes Laconicae, the Spartan Dogs, that Caesius cited for both of the Wains. Now when, after completing a revolution round the pole, the Bear with muzzle foremost replaces her unceasing steps in her former tracks, never immersed in Ocean but ever turning in a circle, to those born at such a time wild creatures will show no hostile face, and in their dealings with animals these men will find them submissive to their rule. Such a one will be able to control huge lions with a gesture, to fondle wolves, and to play with captive panthers; so far from shunning the powerful bears that are the kin of the constellation, he will train them to human accomplishments and feats foreign to their nature; he will seat himself on the elephant’s back and with a goad will direct the movements of a beast which disgraces its massive weight by yielding to tiny jabs; he will dispel the fury of the tiger, training it to become a peaceful animal, whilst all the other beasts which molest the earth with their savageness he will join in friendship to himself; keen-scented whelps he will train. It is a large and important constellation, containing 87 stars, of which one is of the 1st magnitude, four of the 2nd, three of the 3rd, ten of the 4th, etc. It always presents a splendid appearance, and is perhaps, therefore, the best known of all the constellations. In the Book of Job (9:9, and 38:31,32) it is mentioned under the name of Ash. “Canst thou guide Ash and her offspring?” which is rendered in the AV, “Arcturus and his sons,” and in the RV, “The Bear with her train” (marg., “sons”). The Arabs still call it Al Naish, or Annaish, the assembled together, as sheep in a fold. The ancient Jewish commentators interpreted Ash as the seven stars of this constellation. They are called by others Septentriones, which thus became the Latin word for North. The star ε is called Alioth, a name we have had in Auriga, meaning a she goat. The star ζ (in the middle of the tail) is called Mizar, separate or small, and close to it Al Cor, the Lamb. The star η (at the end of the so-called tail) is named Benet Naish (Arabic), the daughters of the assembly. It is also called Al Kaid, the assembled. The star ι (in its right foot) is called Talitha. 3. Astronomica, Manilius, 1st century AD, p.27, 29, 357, 359. 4. The Witness of the Stars, E. W. Bullinger, 37. Ursa Major (the Great Bear).